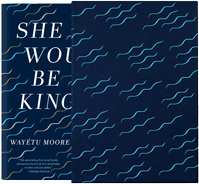 Wayétu Moore’s remarkable debut novel, She Would Be King, is a fantastical and nuanced history of the founding of Liberia. Strikingly, She Would Be King is less concerned with the politics of the 19th century — though those are thoughtfully explored — than with the origin stories of the many peoples who ended up within the Liberian territory. The novel’s three main characters, Gbessa, a beautiful but cursed girl exiled from her village, June Dey, the son of a ghost and an American slave, and Norman Aragon, the child of a Jamaican colonialist and a Maroon woman, possess extraordinary gifts that enable them to fight the agents of colonialism and slavery. They are heroic people, but deeply damaged by the violence in their lives — violence that comes both from the expected cruelties of slavery and greed and the more surprising antagonisms within villages, among native tribes, and between the African American colonists in Liberia. While not polyphonic in its narrative approach, She Would Be King beautifully highlights the plurality of voices present at Liberia’s founding, eschewing a patriotic or cynical retelling in favor of a story that through magical realism, historical detail, and a deep compassion for its characters recognizes the complex dynamics and audacious spirit of early Liberia. We're proud to present She Would Be King as Volume 76 of Indiespensable. Rhianna Walton: The three main characters in She Would Be King, Gbessa, June Dey, and Norman Aragon, allow you to explore three regions central to the slave trade: the American South, the Maroon community of 19th-century Jamaica, and the local tribes along the western coast of Africa. These communities were also central to the formation of Liberia and modern-day Sierra Leone. You write that the genesis of the novel was your mother’s story about the old Lai woman who beat her cat to death, which grew into the story of Gbessa. When did the novel expand to encompass other characters and places? 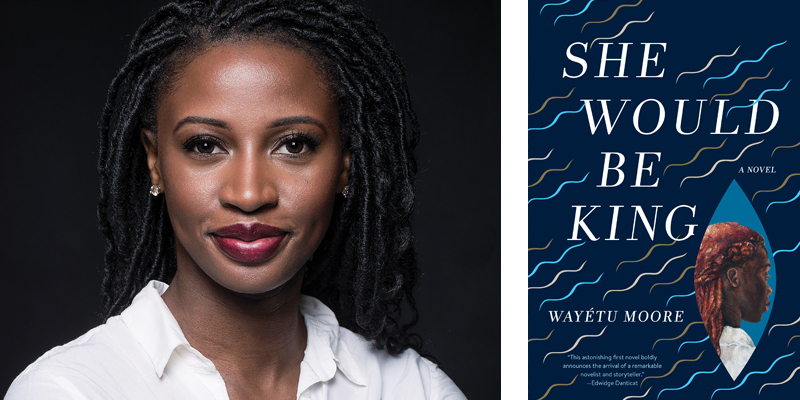 Wayétu Moore: I knew that I wanted to tell the history of Liberia when I started to write. The goal was to explore Liberia's history, with its color and complexity, through the written word. In order to do that, I had to, of course, talk about the groups that existed before Liberia was Liberia. I think contemporary knowledge, or certainly Western knowledge, is that Liberia became a country when the settlers from America and the Caribbean moved to the region, but the indigenous groups were there hundreds and hundreds of years before and really did have systems of government that existed. I always knew that I was at least attempting to tell the whole story of Liberia, and in order to do that, I would have to go to different places. I knew I would begin with the indigenous perspective, but I would have to visit America and visit the Caribbean if I wanted the entire story to be told — of the free blacks and former slaves from America and the Caribbean, mainly Barbados, who went over during the 19th century, and actually in some parts of the early 20th century, when the Back-to-Africa movement was revived by Marcus Garvey. That movement, the immigration from the Americas to Liberia, lasted for about a century. We're thrilled to present She Would Be King by Wayétu Moore as our selection for Volume 76 of Indiespensable. Powell's subscription club delivers the best new books, with special attention to independent publishers. Rhianna: What made you want to explore Jamaica as opposed to Barbados? Moore: I was very much inspired by the Maroon story of rebellion up the mountains. A lot of the countries in the Caribbean, as well as America, have stories of slaves rebelling. I think that the story of the Maroons, and then I guess of the Haitian Revolution, are the most popular and prevalent. I was very attracted to the Maroon story of rebellion, because I think in many historical narratives you find that saviors always come from the outside in some way and are not within the country. It was very important to me to explore figures within this community. There were always people who were fighting back. Rhianna: One of the things I found really fascinating about your book is that the foundation story of Liberia isn’t monolithic; it’s really a collection of different origin stories. As such, it read to me as much like a folktale as a history. I was wondering how you see those two forms at play in the novel. Moore: I think that when Western audiences read anything that is foreign and historical, it translates as myth, but if someone from Liberia was reading this, it would just read as a story. I realize that my introduction to storytelling was through magical realism. That's how I came to understand the infrastructure of story, because it’s central to the West African storytelling tradition and specifically the Vai tradition. My mother's Vai. She was the one who told me stories growing up, as did my grandmother. It was rare that I heard a story without someone shape shifting or displaying some supernatural ability. This became my understanding of how stories work. Yes, there are myths that exist in the Vai culture, for instance, Mami Wata. Mami Wata actually exists throughout the diaspora in different forms; she is our iteration of the mermaid. But I don't read it — and I don't think my compatriots and the Liberians who have read my book read it — in relation to myth, because we are so used to this form of story. This chorus is a song for and to and obviously of black womanhood. Rhianna: Is the question offensive? Moore: I don't think it's an offensive question. I do think that, yeah, it's a question that comes from a place of perhaps not being as familiar with those traditions of storytelling; and then also, to be fair, those traditions of storytelling were primarily oral. Now, in getting to a place where we're writing these things down a lot more and black writers across the diaspora are engaging with magical realism and fantasy, which are very culturally authentic forms that have existed in our stories for so long, those questions are going to come up. Because in Western culture, that is where you find those genres. To be honest with you, I was raised in the suburbs of Texas. What I learned of Liberia was at home with my parents. If I were depending on the textbooks, I would have had issues with confidence, and might have been conflicted about a lot of things because of how Africa is presented. Even just African American and black identity here were really burdensome. I think erasure takes a toll, and then when there is an instance where you are featured, it's always in this somewhat cynical way. I never indict anyone because I had to seek that knowledge. It wasn’t firsthand because I didn't spend my formative years in Liberia. I then don't blame anyone for not knowing. My hope is that the novel opens the door for the exploration of more obscure histories that are connected to American history , and that this trajectory of African speculative fiction continues. I'm just so thrilled and excited about where the industry's going in relation to how it's engaging with writers from the continent. Rhianna: I was really taken with something you said in a profile piece about how when children in low literacy countries like Liberia learn to read, they often do so with American books. So at the same time that they’re trying to learn sounds and grammar, they're having to conceptualize things like pizza or American football that are completely foreign to their everyday lives. It makes learning to read really difficult. One of the main goals of your publishing company, One Moore Book, is to create children’s books that reflect the readers’ cultures. How does your work with representation in children’s literature dovetail with your work as a novelist? Moore: I don't think I went about writing my novel with the same emphasis that I go about with One Moore Book. When I started writing my novel, I was just wanting to write, to engage with this craft and with this art form in a meaningful way. What came from it, because I'm from a culture and from a group that is so underrepresented — and to be fair, Liberia is so small, only four and a half million people, and we have had a series of tragedies over the past several decades. Because of that, art from Liberia, that's thriving on the continent, is relatively hard to find outside of Liberia. I think because of that, naturally, just by a function of who I am and where I'm from, the things that I produce will speak to and correlate with the mission of One Moore Book. I think there are some artists who, just by a function of who they are, if they're choosing to write about their culture and feature their culture, then their work is going to speak to the need to create more vast representation within the literary industry. Who is she? Is she truly immortal? Why? Rhianna: Something that often comes up in your interviews is the idea that reading enables one to recognize the truth amidst all of the nonsense and negativity of everyday media. You’ve said: "Demanding truthful and fair representation is revolutionary." How did the high value you place on truth in literature impact the ways you chose to write about the people and places in She Would Be King? Moore: Thank you for asking that. Just last night, I was at the Graywolf Literary Salon. I was having conversations with some of my colleagues and peers about how truth interacts with our work. Specifically, for me, as a Liberian and being from a place with such a complex history, what happens is we hear stories about Liberia in the binary, like, Oh, they were good guys. The others were bad guys. Particularly in the context of the freed blacks who went back, and their interactions and relationships with the former slaves, the way that it's told is from a very cowboys and Indians perspective: they went back and they enacted some of the same brutalities that they faced in America. That's completely untrue. It's exploited. Yes, there was some social stratification, but a lot of Liberians are mixed. I'm mixed. My paternal side is from South Carolina. They moved to Liberia in 1871. My maternal side is Vai just like the heroine in my novel. They've been in Liberia for hundreds and hundreds of years. But the way it's presented is that these two sides were at war. Yes, there is a lot of strife in the intraracial dynamics at play in Liberia. But I really wanted to delve into some of the nuances. I wanted to uncover what happens when a group of people who were brutalized psychologically and physically, as well as those who were free, say, Hey, we're done with this place. We want to figure out a home for ourselves. They find this home, and then they have to negotiate with the reality that they're in a place that was previously occupied. But the people they're in this place with, they look like them. Obviously, they have different cultures and ways of life. What that creates are nuances that are more complex than the black-and-white story of the settler native narrative. It becomes even more complex, because you don't have some of the same racial paradigms that you do in traditional settler native narratives. It was important to me to engage with those nuances and to talk about what happens in those contexts in a way that isn't so dramatic and that doesn't exploit Liberia's settlement, or the settling of Liberia, I'll say, to alleviate some sort of guilt or exploitation. Because it always comes off to me like, OK, well, they were treated a certain way in America, but see, they went back to Liberia and they treated the people there the same way! It's a very cynical assumption. Part of what I wanted to do was to explore the subtleties of what was happening and the fact that there were intermarriages as opposed to constant fighting. Rhianna: She Would Be King totally disrupts that kind of binary storytelling. I was fascinated by the nature of Gbessa’s curse. On the one hand, it seems really arbitrary and cruel — a punishment for being born on the wrong day. But on the other hand, Gbessa is magical, something that manifests both in her unusual appearance and her gift of immortality. It made me wonder if her gifts are a remarkable, radical response to adversity, or if the villagers were on to something? Moore: With June Dey and Norman Aragon, their gifts are clear. You know what they do. You know how these things function. Gbessa… she's immortal, but she is born in a context that is very superstitious. She's born in a context that is sort of frustrated by the brutality of tradition, or some of these things that existed to establish systems of government and structure. Part of what superstitions and religion, traditional indigenous religions in the West African context, were used for was to create structure. It was a coincidence that Gbessa was born on this day. But she is gifted. She is immortal. It just so happens that she is then condemned and realizes her immortality perhaps sooner than she would have. I wanted the reader to constantly be in question about what is going on here: Who is she? Is she truly immortal? Why? What is the role that her culture plays in her life and in her understanding of her gifts? I was raised in a Christian household, though my parents always encouraged my curiosity. I do know people who were raised in households where everything that seems secular or worldly was shunned. And let's be honest: a lot of these religions are colonial religions. And so having conversations about both the benefits and disadvantages of indigenous religious thinking and then, of course, colonial religious thinking later on in her life, because she does convert to Christianity, and how they play a role in her understanding of this gift and this immortality, was important to me. I wanted Gbessa to constantly be in question and in conversation with this gift, as well as the sources of the gift and religion; I wanted this for the readers as well. That was intentional. I didn't frame it to place responsibility or give any sort of credit to the Vai people in the story. But that is an interesting thought. I think it's actually a beautiful thought: What if they were on to something? Hope is just a part of the rhythm of the country. Rhianna: There are two moments in the book, with regard to religion, that have really stuck with me. The first is when Gbessa decides that she wants to become a Christian because the Christian God is the God of cursed people like herself. The second is a line of dialogue from Sia, a villager whom Norman Aragon and June Dey meet in their travels. She says: "We settle here for our new God. Learn English. God come into our house and we welcome him and love him like he love us. But the house God come into is still ancestor house. You leave your house when visitor come?" I just thought that was a perfect distillation of how colonial religion can coexist with indigenous beliefs. Moore: I feel like my mom is a good example. My family is Vai. My mom is Christian and very religious, but she's also very superstitious. There are things that never left her and that I don't think ever will. I don't bother asking her how some of her thinking and superstitions interact with her religion because I don't have to. I sort of just know and have an understanding that those things coexist. They always will. I think that Christianity, unfortunately, joined colonialism as a marker of civility. Even though indigenous groups embraced it, they understood that the standard of Western civility was very different from their ideas of civility. Even though they have embraced this new god and new way of thinking, I don't think that they ever let go of their prior understanding of civility. Or they never discredit the forms and structures that existed. Rhianna: I’d like to talk about the wind a little bit. It’s the only first-person voice in the novel. Sometimes, the wind seems like she’s June Dey's mother, Charlotte. At other times, it’s a more mysterious collective “I.” It pops up periodically to whisper encouragement to the protagonists or to protect them. How did the character of the wind come to you, and how do you think of its role within the novel? At times I wondered if the wind is the narrator. Moore: I would say that Charlotte is part of a collective. The wind is a chorus as opposed to an “I.” She has joined that chorus. Her existence speaks to the ubiquity, I would say, of black women. The narrator, this song, or this chorus, is a song for and to and obviously of black womanhood. When Charlotte becomes a part of the wind she joins this voice of the ancestors. The narrator is an ancestor. That can be singular or plural. There are also parts where she is telling a single story, because even within the collective of anonymous individuals that make up the wind, she can speak to her individual relationship with June Dey. I will admit that I did struggle with the wind and the narrator's voice. I went back and forth. The wind was initially in third person. I wanted to make it more intimate. I wanted to find a way to incorporate the ancestors. I wanted to find a way to incorporate religion into the overall experience of reading the story. How do you engage with a place that, yes, is complex, and where part of that complexity comes from its wrestling with so many different, conflicting identities? Religious identity obviously is a huge part of that. Because it's so conflicted by that, I eventually wanted the reader to then also be in conversation with one of those identities through an ancestor. Rhianna: You mentioned the ubiquity of black women. I feel like this is a very female driven novel. Despite the presence of some really exceptional men, women — the ancestors, the mothers, Gbessa — are the primary drivers of positive change in the novel. Why was it important to you to focus on female voices and experiences in telling this story? Moore: For many reasons, I think the strongest women I know are Liberian women. The strongest people I know are Liberian women. They are powerhouses both explicitly and in the background. My maternal grandmother is illiterate. She can't read. She's Muslim. She got married when she was fairly young, had many kids. But she's a feminist; she married a feminist, and decided that she wanted her daughters to be raised in the city, in Monrovia, to be educated and to see a different world than she did. She never condemned the world that she was raised in because she always honored her religion. She honored her cultural identity and tried to ingrain some of those values in her daughters and grandchildren. Perhaps she saw, in the things that were going on in Liberia in the early 20th century, when she was growing up, that there was more out there. Whatever that more was, she wanted her daughters to have the freedom to explore it. I grew up seeing women like that, women in my family who have started schools and run in the government, who have just done these amazing things… and also just the women throughout Liberian history. It was a Liberian president who was the first woman president in all of Africa. And women played a very active role in the war through the various protests that they were having at home and outside it. I feel like even though women tend to be undermined in many African societies, they are the backbone. They are who make these societies and these homes run. They run the economy, they run the social sectors, and they are in charge of education, in ways that people just don't fully grasp. I knew that if I wanted to tell the story of Liberia, or attempt telling the story of Africa, then it had to be through the eyes or from the perspective of womanhood, black womanhood and African womanhood. Rhianna: The 19th-century Liberia of She Would Be King stands in many ways in stark contrast to Liberia today, thinking in particular about the high poverty and low literacy rates. The hopefulness of your novel, and the strength and passion Gbessa, June Dey, and Norman demonstrate — are they in any way a metaphor for your optimism and hopes for Liberia’s future? Moore: Absolutely! I hope it speaks to what Liberia is now as well. Every time I go — I was back in July — there is a hope and optimism. People tend to just keep it moving. Obviously, in some ways, it's sad because then there is an aspect of desensitivity to that. People become desensitized to the various traumas and tragedies that may happen because of where you live, because of the country you were born into. But a lot of that is just genuine optimism and seeing the world for what it can be. I think that that is the natural essence of what Liberia is. It is a serious, joyous place, a beautiful place. That hope is just a part of the rhythm of the country. The mood of the country is hopeful. Writing the Liberian story, I wanted to make sure that some of that musicality that I experience every time I'm at home was part of the narrative. Because you'll meet people, and you would never know what they've been through, the darkest tragedies. The way that they go about life, the way they go about every day is inspiring and fulfilling in a way that I can't even describe with words. That's something that I knew was necessary and essential to the novel. I spoke with Wayétu Moore on September 7, 2018. Wayétu Moore is the founder of One Moore Book and is a graduate of Howard University, Columbia University, and the University of Southern California. She teaches at the City University of New York’s John Jay College and lives in Brooklyn. She Would Be King is her first novel.